Now that we have examined the past and future trends of social media let’s talk about the “unspoken rules” in social media. It may come as a surprise, as you initiate a social media strategy, how important it is to incorporate foundational guidelines before you begin to share with your audience. Guidelines! Who likes guidelines? No one likes to be restricted by stuffy guidelines! No one wants to rely upon a set of concrete rules mixed with the creativity of social media. Rules are contra-indicated! Rules may curtail the creative nature of a social media strategy! However, if you do not consider these rules, you can consider yourself warned! These “unspoken” rules for a social media foundation are designed to guide you in a decision-making process that will influence your ongoing engagement with your audience. There is an expectation that you will take the initiative to apply an “unspoken etiquette” before engaging with your audience. Before you enter a conversation with your target audience, there is an expectation that you will have put forth what I call “due diligence” or “footwork” to get to know your community. Due diligence includes cultivating a relationship with your community by listening intently before you start contributing all “willy nilly” to the conversation. Nothing turns a community off more than a contributor who didn’t bother to take the time to listen first. When you listen to the conversation, there are initial steps that you will need to take that becomes obvious only when you listen. The steps you take will also demonstrate to your audience that you did, in fact, listen to the conversation first. For example, simply by listening to the conversation your list of individuals or companies that you follow on your social media accounts will immediately reflect that you have given some thought to who you are, who are the influencers in your community and to what you are offering to the targeted audience. Who you follow online matters. You also should be aware that who you are not following is equally important. In the short video, “10 Laws of Social Media Marketing” by Susan Gunelius and featured on Entrepreuneur.com, describe the basic foundation for a building a social media strategy. These ten recommendations are crucial for understanding the investment that needs to be made before you begin to engage with your audience. In my very first social media class, the students were so eager to just “get out there” and start posting away. My professor had to pull back the reigns and point out to all of us there were unspoken rules based on a core set of values that are the foundation to building a successful social media strategy. By listening, you can implement steps that will help you to provide valuable contributions to the conversation and determines how will you help your community to find the information they need. By applying these foundational values to your social media strategy, you are bringing value and quality to your audience and creating a successful social media strategy. 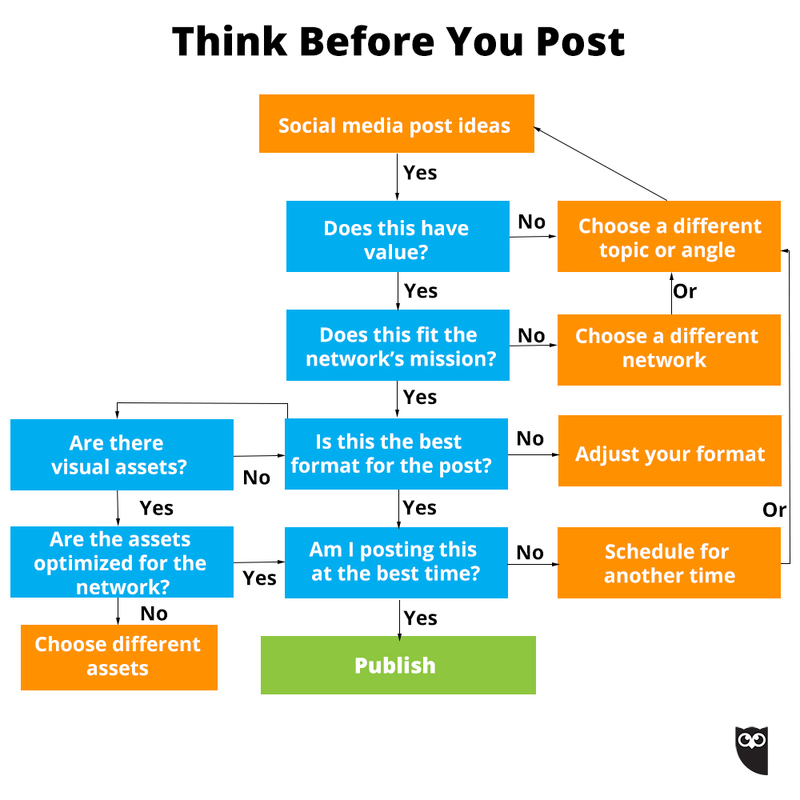 Hootsuite also offers a great flow chart outlining core questions to ask to create value for your audience. Thank you, Susan Gunelius and Entrepreuneur.com and Hootsuite for providing an informative video and flow chart that gives a brilliant explanation of how to build a strong foundation for a successful social media strategy. In the next post, we will look at Search Engine Optimization and how to measure the success of your social media strategy. What are some other “unspoken rules” to consider before you engage with your audience or when you are building a foundation for your social media strategy? Welcome to my blog dedicated to the practical application of social media strategy.